Apparently I'm starting a trend. Last year I didn't intend to have my first post of the year be the book-reading summary. This year, I totally intended it. I'm going to post the things that Goodreads reported as well as my own accounting where I disagree with them. My goal was 50; I read 55. Yay! However, the page count here is wrong. As it turns out, Goodreads lists the page counts for some book mediums strangely, especially ebooks. The page count I calculated after some manual research was actually 19,684. This is still a large mark down from last year's totals of 65 books and 23,442 pages. It turns out I hadn't populated the end date for Johnathan Strange & Mr Norrell, so even though it was in my Finished list, and it seemed to count in the reading challenge, it didn't show up as a contender in the longest book competition. Last year's largest book was a paltry 736 pages (Bag of Bones by Stephen King). Two books of poetry and one philosophical tome were my three shortest books? What does that say about art and thought? :-| One other quick note: the copy of Tao Te Ching I read was a translation by Ursula Le Guin, and was REALLY well done. If you're at all interested, I highly recommend getting a copy. Given that one of the largest books was missing from the Goodreads calculation, the Average Length was actually 364 pages. 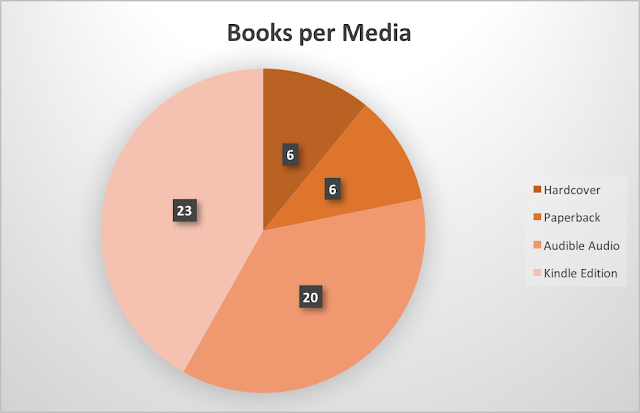 For reference, the median book page-count-wise was Walden by Henry David Thoreau, at 352 pages. 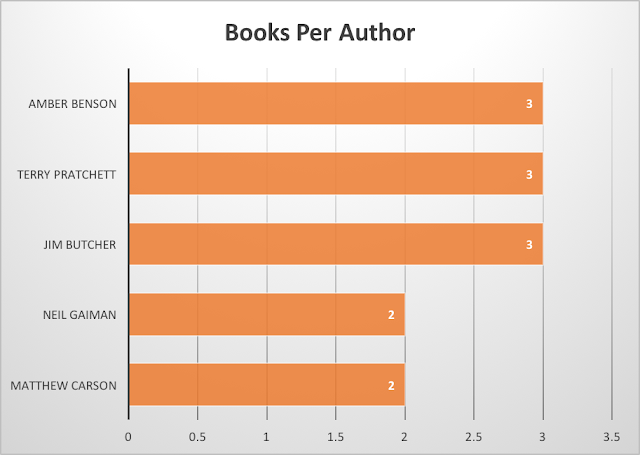 That's all I'm going to include from the Goodreads stats. If you're interested in the full page, here's the link to the Goodreads summary. From here on out, it's custom graphs. Buckle up! Good grief, this chart is all over the place this year. 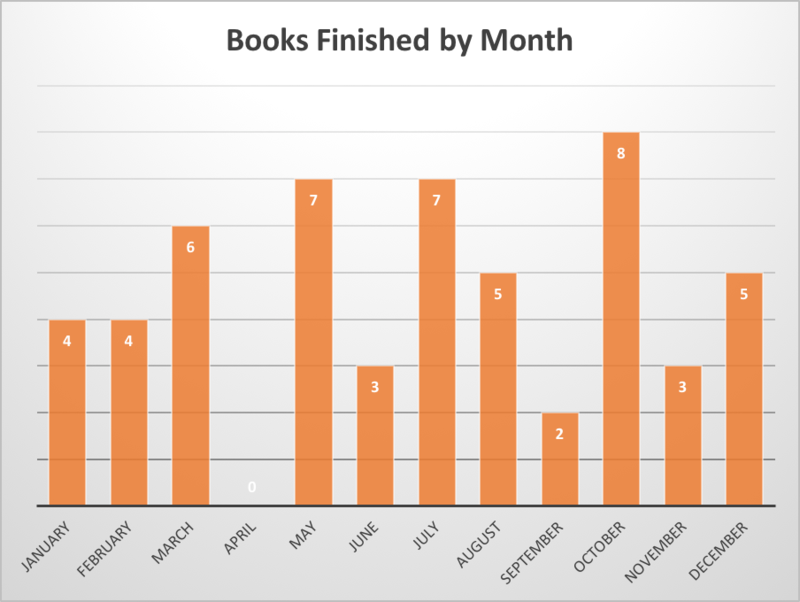 There was a month where I didn't finish ANY book at all (April), right in between a 6-month and 7-month set. To be fair, it just so happens that I started some large books in April and finished a couple in May (including Johnathan Strange & Mr Norrell). Last year, I read SEVEN Brandon Sanderson books. This year only thirteen books had shared authors, which means that I read books from 45 different authors. That seems like a good thing! Interestingly, I read just as many books by Amber Benson as Jim Butcher this year (three each). I did that because I knew I was going to meet her at HawaiiCon, and I'm glad I did. Not only did we get to talk about writing a bit, but Amber's a fantastic author that plays with mythology in at least one of her series and also writes collaboratively with other authors, all of which I'm interested in. You should check her out if you have the chance. She's on break from social media (not counting Instagram), but you can have a look at her Goodreads page. Ah, the return of the book media distribution! How I've missed you, pie chart! Since I don't commute to work anymore, my Audible consumption has gone down as a percentage. That being said, I still listen to books almost as often as I read them. I tend to listen to books while I'm working out in the mornings or driving to pick up the boys. Kindle won the day with 23 of the 55 books, but actually reading as opposed to listening totaled 35 of 55. That's a big piece of pie! And that was my year in books. I've entered the challenge again this year, and strongly encourage you to do so as well. Goodreads is a wonderful tool that provides a social aspect that I generally underutilize. If you're on Goodreads and we're not pals there, look me up at this link. This year I'm trying to get to 60 books. So far, I've finished one and am reading three others. Technically, I'm on track, but two of the three I'm currently reading are 700+ and 1000+ pages. Wish me luck! And see you there! !